Welcome to the Thylacine Research Unit’s first Newsletter for 2017! There has been a LOT of activity in the world of thylacine recently. In the later parts of this newsletter we have provided some links for you to check them out yourself. Of course, you can always head to our webpage at https://www.thylacineresearchunit.org or our Facebook page https://www.facebook.com/thylacineresearchunit/ to keep up to date with the latest happenings! Our Animal Planet show, Hunt for the Tasmanian Tiger is still airing around the world. We have been very pleased at how well the show has done. It also has had another long run on Foxtel in Australia. So, if you haven’t yet seen Episodes 1 and 2 of Season one head over to Foxtel to check them out. It’s at least four times in the month of February. We do frequently get asked about additional episodes of Hunt for the Tasmanian Tiger. We have been in discussions with the producers about doing a BUNCH more episodes – but like all things in the TV business nothing is certain. BUT, you can help us out. If you are in Australia or New Zealand, you can go to this Facebook link and post that you would like to see season 2 of Hunt for the Tasmanian Tiger. You just need to say that you would like to see a second season of Hunt for the Tasmanian Tiger! The above link applies to anyone in the world. Just enter Hunt for the Tasmanian Tiger in the suggestion box! If you do, follow through on the above request drop us a message on either Facebook Messages or our email and we will send you one of our soon to be released TRU Thylacine Road Trip Stickers to say thank you! We were lucky enough to be invited to appear on American Travel Channel’s hit TV Show Expedition Unknown. The TRU team featured as the professional thylacine investigators and took the show’s host – Josh Gates on a night investigation. Other than featuring TRU there was also some very interesting new information on mapping thylacine DNA for potential future cloning efforts. We continue to have cameras in the field 24/7. Many of these cameras have been donated by followers of the team. It’s this kind of support that makes our research possible. Many of our cameras have been named after their contributors – so if that camera catches evidence of the thylacine – their name will be forever associated with re-discovery! In the last week of January 2017 there was some information that came to hand about a potential video and still image show a clear and distinctive thylacine. This set parts of the thylacine community into a mini frenzy. TRU is aware of this video and it is not as clear cut as some commenters have suggested. It is taken in a location that we are aware of and have investigated previously. The original sighting report was made to TRU and some details of the original sighting are in one of our previous podcast. 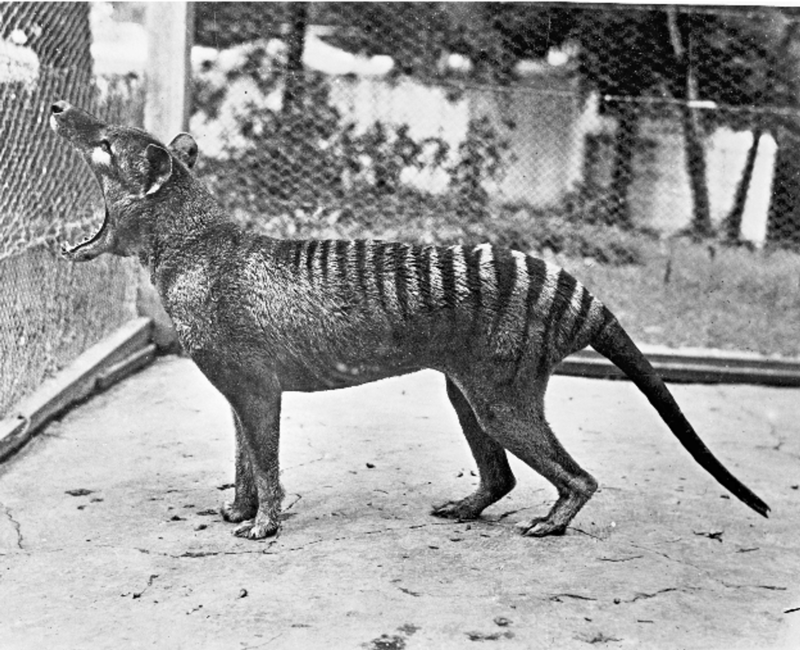 …and a mystery caller lets the world know about a possible video…..
Whilst some were excited enough to claim this was proof the thylacine was still with us – some without having seen the video at all. We remain sceptical (but as always hopeful). Big claims require big evidence. Time will tell. Finally, we have a new thylabites video where Bill Flowers takes us to the site of a historical thylacine event.